San Francisco Facades+ Performance Conference: One Month and Counting! - Archpaper.com San Francisco Facades+ Performance Conference: One Month and Counting! 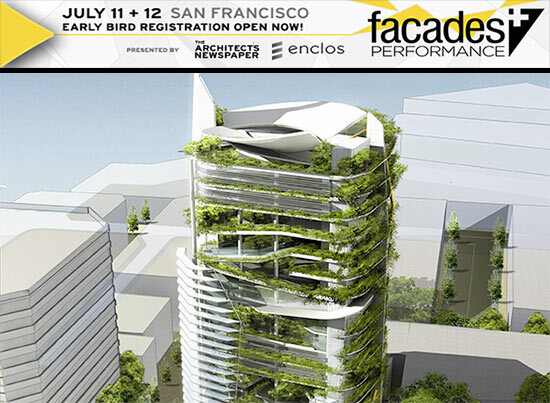 San Francisco Facades+ Performance Conference: One Month and Counting! The San Francisco Facades+ Performance conference is exactly one month away! Join the conversation and rake in up to 8 AIA LU credits per day at the conference, presented by AN and enclos, July 11 to 12, 2013. An abundance of good information, networking opportunities, and hands-on workshops are on the agenda, so don’t miss the chance to attend this year’s invaluable two-day event. The symposium on Day 1 consists of exciting presentations and discussion-based panels that investigate the ever more fast-paced development of facade technology, tackle new-fangled viewpoints on building skins, and discover ground-breaking, sustainable design practices. Ken Yeang of Hamzah & Yeang will present the morning Keynote Address, Eco-Architecture: Living Facades and Architecture and Gary Handel of Handel Architects will give the afternoon Keynote Address, Glass Without Guilt. Dialog and Tech Workshops form Day 2, which offers a rare chance to participate in comprehensive conversations with renowned design professionals in a small seminar-style setting. Participants have the opportunity to customize their specific programs to cater to their individual professional goals and interests by choosing half-day workshops from morning and afternoon sessions. Participants may also select one of six daylong workshops in which they will work closely with industry professionals on hands-on projects to build indispensable skills essential in utilizing revolutionary facade technologies. Speaker highlights include Edward Peck of Thornton Tomasetti, Claire Mazfield of Atelier Ten, and David Frey of SOM among other exceptional panelists. Take a look at the agenda and register today – Early Bird registration ends this Friday, June 14.